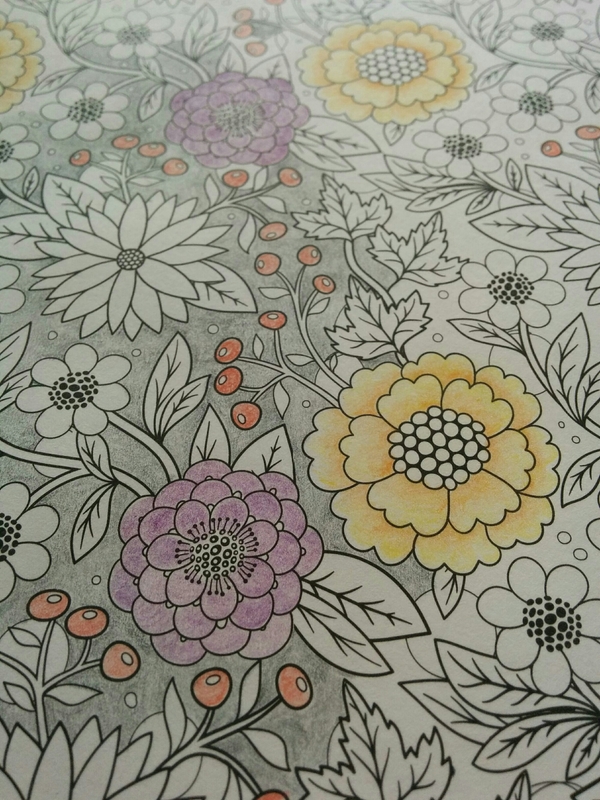 I completely forgot to photo the bows and flowers that I was making this evening, so I’ll take this time to show you some colouring in. I mentioned that I bought an adult colouring book. I’m still on the first page, going slowly, since it’s a relaxation and time filling activity. As I colour this, I think how well this pattern would work with silk painting. I’ve noticed, while watching artists on YouTube that there seem to be two types of people. Those who work on the entire picture, going through each stage at a time, colouring all of each colour at once, and those people who will work on tiny areas until they are finished, working around the image. I’ve found most seem to be the latter, but I’m not one of those. I work on the whole. This seems longer and less pay off, but I can’t seem to work the other way. By the time I’m half way through, I change my technique or forget how to make colours or whatnot. I discovered this cool effect when I was having fun covering things in glitter paint. The paint has a transparent colour put in as a base so it helps bring out the colour of the glitter. 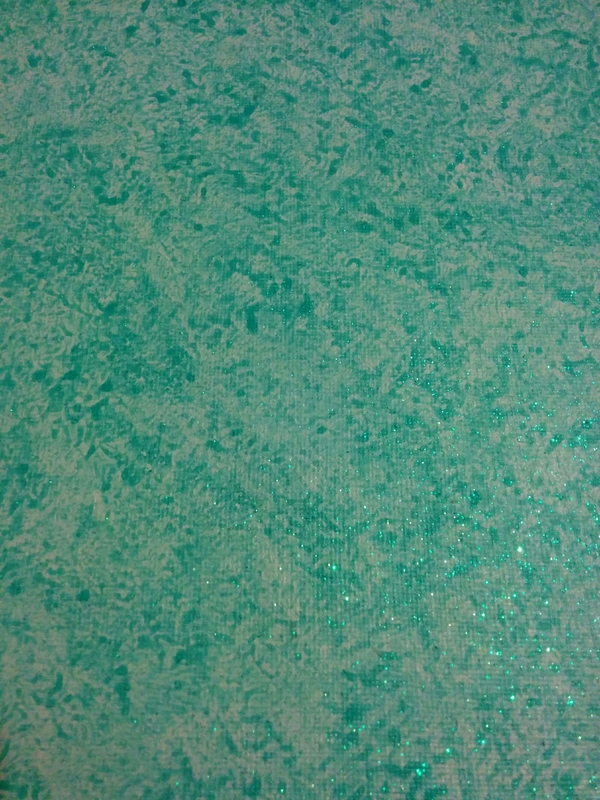 I think this is the difference between glitter paint and glitter glue, but I’m not sure. I found that stippling the paint onto the object with a stencil brush, made the glitter more dense. This was fun, so I decided to cover a canvas, that I had prepped, nearby. As I had a base colour on the shape I was covering before, I couldn’t see the design until I put it over a white base. I was going to layer the paint, but this turned out so pretty, I don’t want to add to it. I’m just not sure what to do with it now. I did have my red glitter on it and I like that combination, but I’m not sure. Apart from that, I’ve just been adding more paper layers to all my projects, as well as tissue. I layered glue and tissue in the lids of my paint tubs, and came out with a cool, textured coin shape. So many cool things that I have no idea what to do with. With presents finished and given for this month, I have some free time. I didn’t know what to do with myself this evening. I was going to chill out, and paint some boxes that I had laying around, but they were on the opposite side of the pile that is my craft room. I had to move all tables, drawers, boxes and random objects to one side of the room, so we could get a floorboard fixed today. This renders the craft room unusable until I can work on it. Hopefully soon. 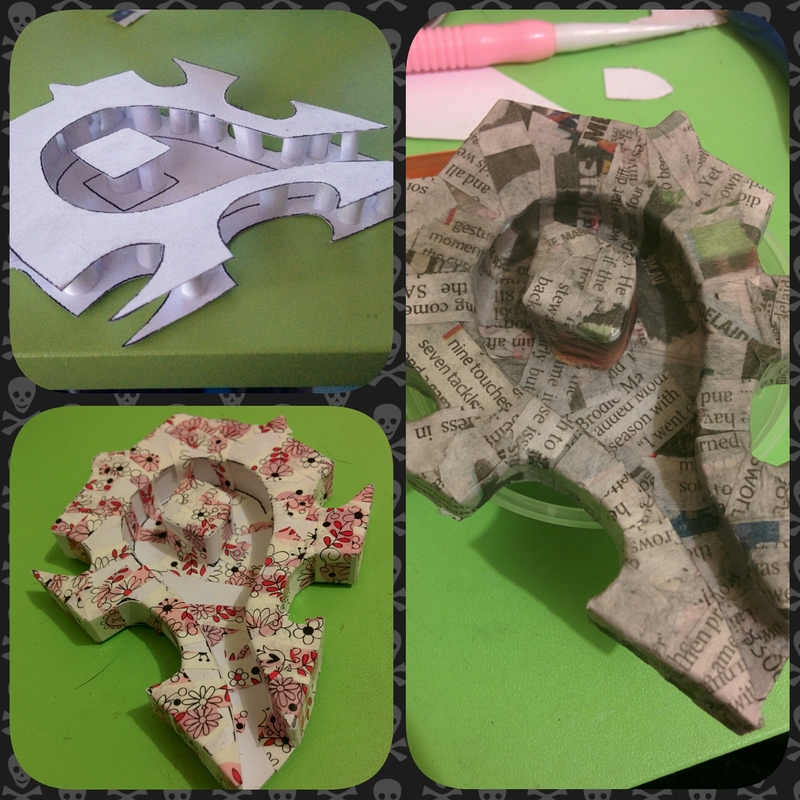 Due to this, all I had to work with was some paint, card, tape and paper mache supplies that I had out. So, I decided to work on making our house more geeky. The horde logo, and guild sign are nice and sparkily now, so I was wondering whether I should make more logos to go with them, or large versions. I ended up attempting to make Mjolnir from the Thor movies. The base shape wasn’t too hard, a bevelled box with all straight edges. I think I’ll put a couple of layers of paper on before cutting a hole for the handle. I forgot to fill it with paper to help stabilise the structure. You’d think I’d have thought of that while I was struggling to tape shut an empty, flimsy box, but I didn’t. I’ll see how it goes. I guess if I continue making these small sculptures, our house will be filled with mini geek symbols all over the walls. I’d better move onto another craft soon. Just when I thought I had done enough paper mache for a while, I felt like making another shape. 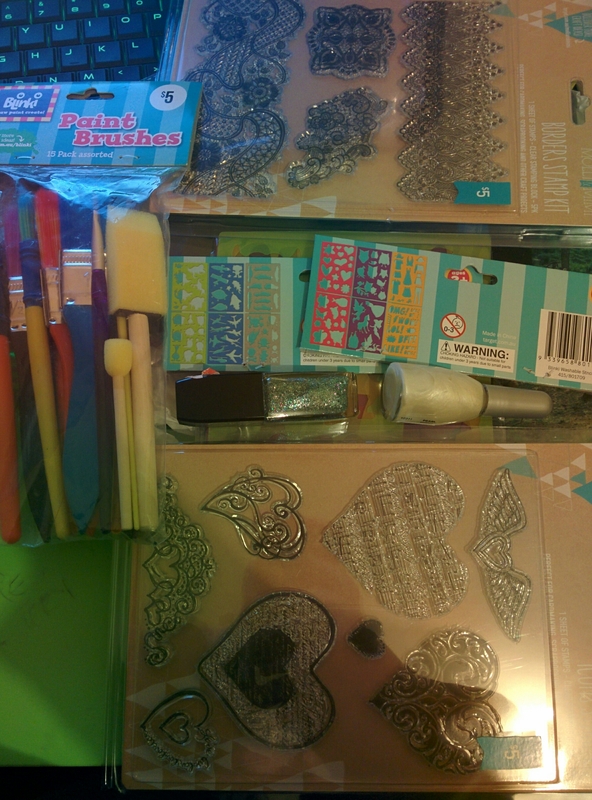 Mainly so I can paint it all sparkly. Painting objects is so relaxing, but I have to make the objects first, I guess. This guy is the logo that represents our in game guild. It’s basically chosen from a few they give you, and you choose colours and wear it as a tabard and display your banner, etc. Our colours are green and black, so this creation has earned some green-blue coloured glitter paint in its future. I’d use plain green, but the turquoise is prettier. 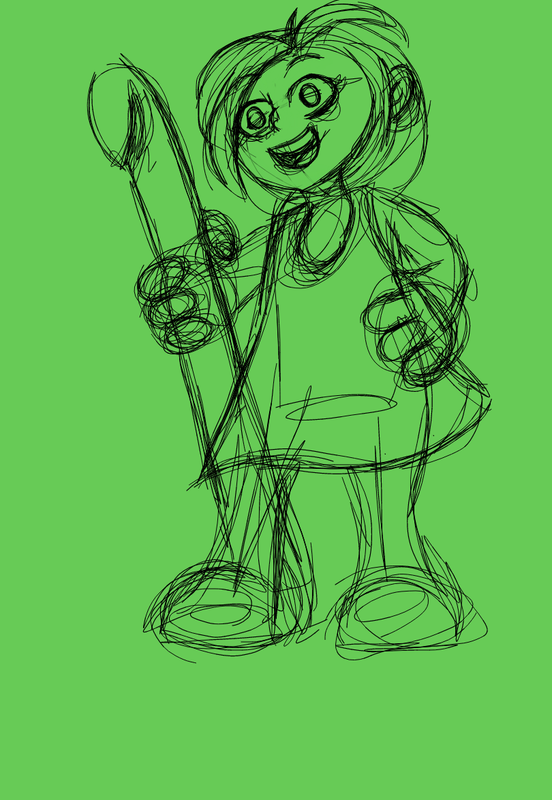 If you don’t hear from me for a few days, it’s because I’m doing secret present stuff, or I’ll finally get buried under the pile of projects that I haven’t put away. Either way, wish me luck! Sorry for creepy clown nightmares. I haven’t been around lately, due to this guy. He was a birthday present for my other half, and he took me a whole week to do in secret. In case you don’t recognise the mask, it’s from the movie Batman: The Dark Knight, the bank mask worn by the Joker. I downloaded the pdo file (for pepakura) here. I printed the file, which took 12 pages, onto card and cut and scored all the pieces. I folded each line in the direction indicated and began taping together. It would have taken longer with glue, and it was already tricky without holding for drying time. 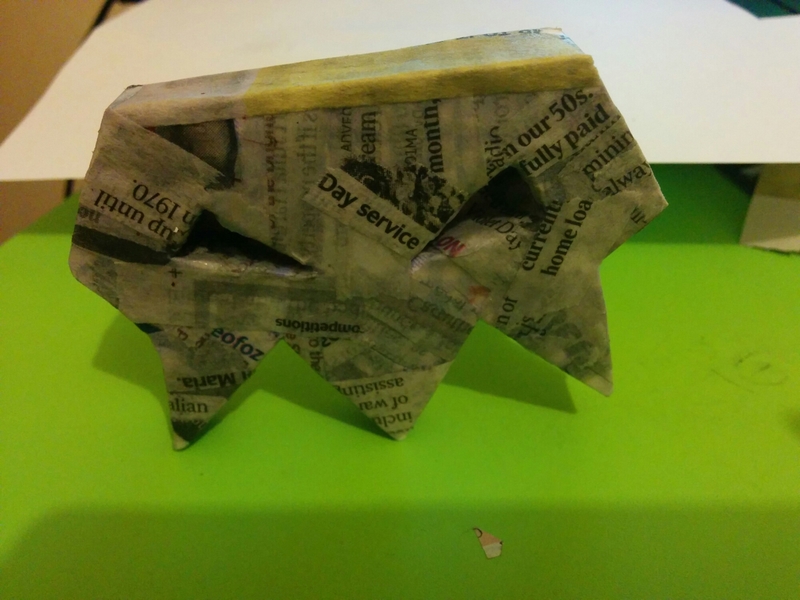 I put a layer of small newspaper strips and glue to begin. This took quite a long time. As I went on, the strips of paper grew. I put a layer of gesso and tissue paper on the outside, and another newspaper layer on the inside. I added a layer of newspaper and gesso before painting. I glued some cotton balls into the nose to keep its shape, but they took so long to dry, even after a couple of days, and in front of the heater and hairdryer. I thought the edges would be less vivid by the time I put all the layers on, but they seemed more pronounced. I couldn’t really sand and shape them in the time frame I had. I’d changed my mind three times on what to make him, so I went from three months, to two weeks, to one week. 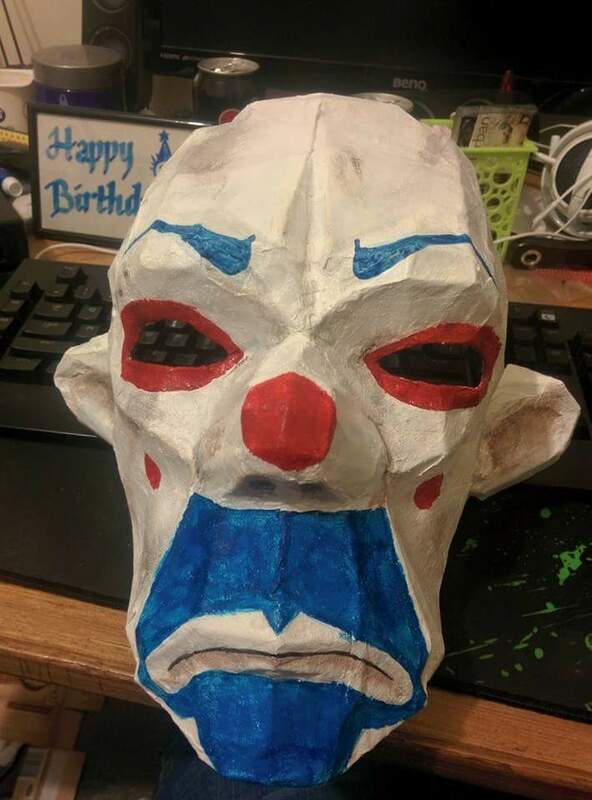 I only realised half way through making the mask that it was going to be creepy, and probably wasn’t a good idea. I already made him a helmet from a game using paper mache, so looks like we might have a collection starting, and I have some ideas on what to make next. When I get around to it. I love being able to make an object from scratch. Most crafts include buying pretty things, and putting them with other pretty things to make a new prettier thing, but paper mache is like creating from raw materials. If I was a traditionalist, I’d use flour and water to make the glue, but it’s still a basic form of construction. The amount of things you are able to create from the ground up is rather empowering. The possibilities are so numerous. Creating with your hands, getting elbow deep in crafting, making things for people you love. So much work and so much fun. Improvisation, maths, logic, physics, cooking, they all play a part in art, it exercises you mind. It’s what keeps me going and gets me up in the morning. All the paper. So much paper. 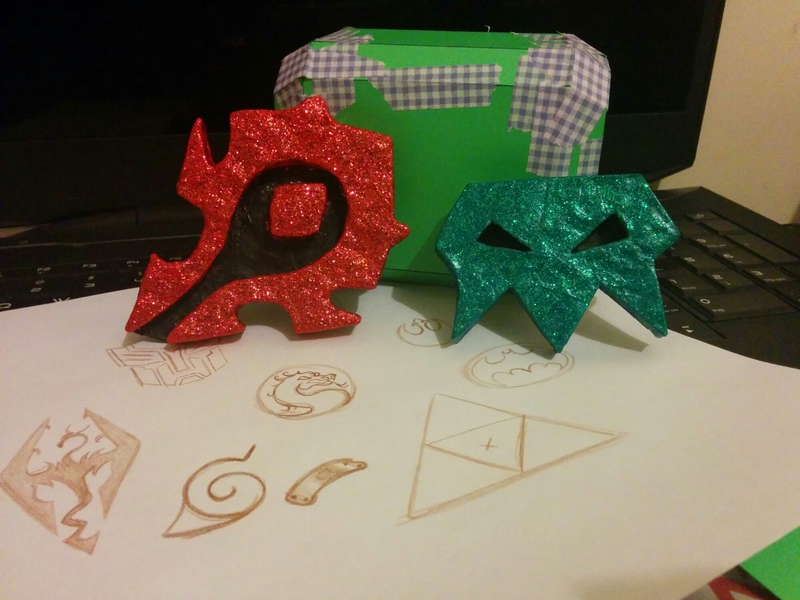 I decided to make a horde logo in paper mache. The Horde is a faction in the game, World of Warcraft, that we play. It’s a nice looking sigil, and much simpler than the opposing faction’s logo, which is a lion. I was going to make it out of clay, but decided while I’m covering paper with more paper, I may as well try a technique out. If all the pieces of the logo were connected, I wouldn’t have left the back piece complete. So, I printed out two logos, onto cardstock that were exactly the same size, and cut one out, leaving the inner section intact, and cut the other out into the two pieces. I also cut a bunch of strips, all exactly the same width. I began constructing the logo by making little cylinders with the strips of card, and gluing them to the base shape inside the lines of the logo. The more you add, the sturdier it’ll be. I then glued the top layer to the cylinders, matching up the logos from above. After this, I used washi tape to adhere more strips around the edges, making the logo into an enclosed shape. This made mine all florally. Next step was to cover in paper. 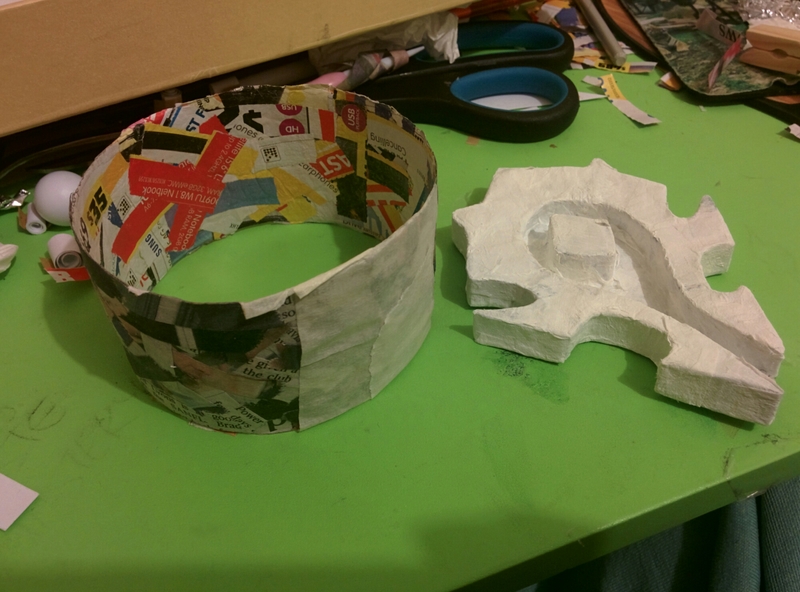 Because the paper mache isn’t making up the structure of the piece, I shouldn’t need to do a lot of layers. I might just add some tissue/gesso for a nicer outer layer, then paint it black and red with a coat of sealant. This technique can be made any size, just use thicker cardboard the larger you go, and can use toilet rolls for the cylinders, and paper tape instead of washi tape. Letters are often made this way, but you can use it for many shapes. Maybe even use multiple layers, or add paper clay for details. Like all crafts, they are just bases for you to elaborate on and project creativity. I really should stop these side projects during birthday season. I have three cards and two presents to get done in less than two weeks. Duty calls, but for now, some beauty sleep.